Backslash Java: Like C/C++, Java also comes with a group of characters treated as a single character and this single character also represents an ASCII value. These characters are known as escape sequences and precede (starts) with a backward slash \ like \n and \t etc. The name is so derived as they escape the normal flow or printing of characters. The \n escapes of printing in the same line and instead prints in a separate line. The following table prints the list of escape sequences supported by Java. Following program shows the way to print the ASCII values of escape sequences (the same procedure you followed in C/C++). Observe the println() statements in the above code; all confusing with multiple backslashes. This is where the programmer should be careful with backslash menace. The above two statements do not compile and compiler raises "illegal escape character" regarding \s. Any letter suffixed to \ is treated as an escape sequence by the JVM. Now \s is checked with the standard list of escape sequences and did not find, the JVM raised an error. Suppose if you would like to have really \s in the code, instead of one \ place two \\. \\ is also an escape sequence and JVM places a single slash (instead of two slashes) in the output. The following works nice. A beginner should take care of the usage of Backslash Java. In writing the regular expressions also, it must be taken care of. The above statement is used in "Java String replaceAll" to replace each digit in the string with OK. The \\d is a regular expression where d represents each digit in the string. It is actually \d is required; but \d raises an error. Instead, \\d is placed which is converted to \d by the JVM and evaluated. This is where the programmer should be capable of. 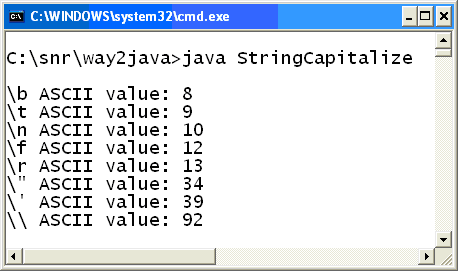 Regular expressions are discussed, to some extent, in way2java.com in JDK 1.4 (J2SE 4) Version. But regular expressions usage is a big subject which requires a good study. You are advised to refer a good Web site that primarily discusses regular expressions. Java split() method is illustrated in Region Matches – Interning – Splitting and JDK 1.4 (J2SE 4) Version. Static constants are useful to access without object and at the same time value cannot be changed. Think, there is variable called “static double $rate = 62.50;”. The $rate can be used in any part of the code without object or with object. But no object can change the value but can use it. Java Made Simple: What is Java and JDK? Why Java is both compiled and interpreted language?